Longing for tousled, airy fullness for a textured, windblown look? 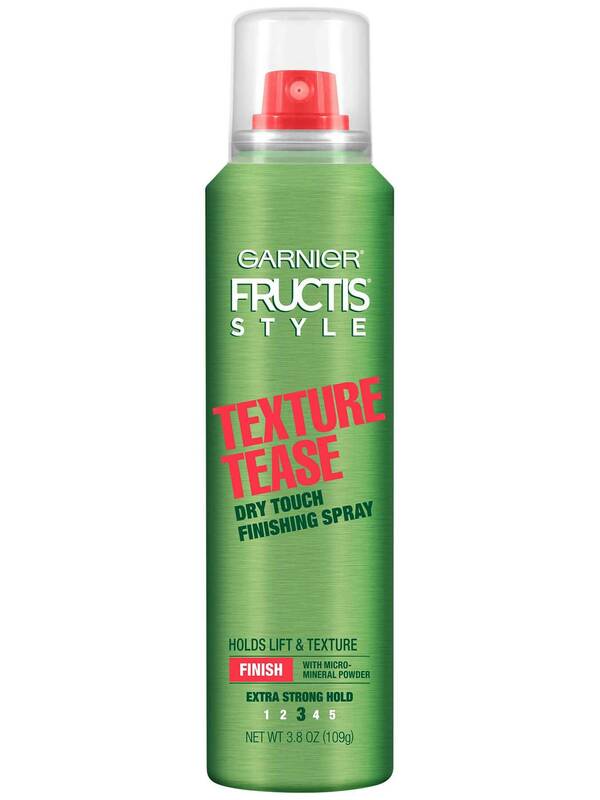 Garnier Fructis Texture Tease is a dry touch finish spray that holds lift & fullness on shapeless hair. Holds textured style all day. Gives a finish that is non tacky, not stiff or weighed down. Innovative micro-mineral powder formula sprays onto strands and delivers a flexible grip so you can rework to keep hair's styled fullness. Dries in an instant with a clean weightless finish to help keep your hair looking lifted and texturized. Shake well before use. Hold can 8-12 inches away from head and spray from roots down to mid-shaft on dry hair. Scrunch and rustle up hair with fingers if desired. For extra hold, divide hair into 2 inch sections and layer product section by section. Take your pony from basic to beyond! Loosely gather hair into a low pony tail slightly above the nape of you neck and secure loosely with a tie. Spray product evenly throughout ponytail from mid-shaft to ends of hair and scrunch. Refresh and rework with more product for extra oomph. Rated 5 out of 5 by laurakissingerx from I am so glad I found this product! I have thick, but fine blonde hair and Im always in need of a good boost of volume! I spray this in the roots and tousle it around, and viola! I have sooo much body after I use this. Rated 3 out of 5 by everydaycarey from I had high hopes for this product. I thought it was going to perform way better than it does. It starts off adding some body and texture, then shortly after it falls flat. I will repeat- It adds fullness, then goes flat. I do not know what else to do. I do not want to tease my hair to make the body stay. While I have thick, long, multi textured hair (loose waves, some curls), I have used it primarily when styling my hair into a simple pony tail. I like to have a little ooph in the hanging part. Same when I am doing a simple side braid- I want the braided part to be not too neat, yet have some hold and fullness. I think I bought it in a 2 or 3 pack, so I will certainly be using this up for some time. Maybe I just need to use more of the product, which I will try. That is, if I can get past the odor. STRONG ODOR!! It is wickedly strong! It will certainly freshen up your hair, and it will also scent up your living space. It is so strong that my dogs leave that side of the house. SAD! GAG! You definitely need some air flow- preferably an open window, or exhaust, maybe a fan. Please don't stand in a small area and breathe it in. It is pretty intense. I'm really rating it on the noxious odor more than anything. Rated 5 out of 5 by saamrogers_ from Literally one of my favorite hair products! I like to curl my hair and this product gives me a stylish messy textured look without my hair looking dry or frizzy! Rated 5 out of 5 by chelseadfd38 from I love everything about this product. Super easy to use, does what it's supposed to do. Gives my hair plenty of texture and volume. And it smells amazing. Great price also. I love this stuff. Only thing that I hate is it's so hard to find anywhere around here. Rated 5 out of 5 by liaagee from This is one of my favorite sprays for when I need volume. It's long lasting and doesn't make your hair flaky or stale looking. 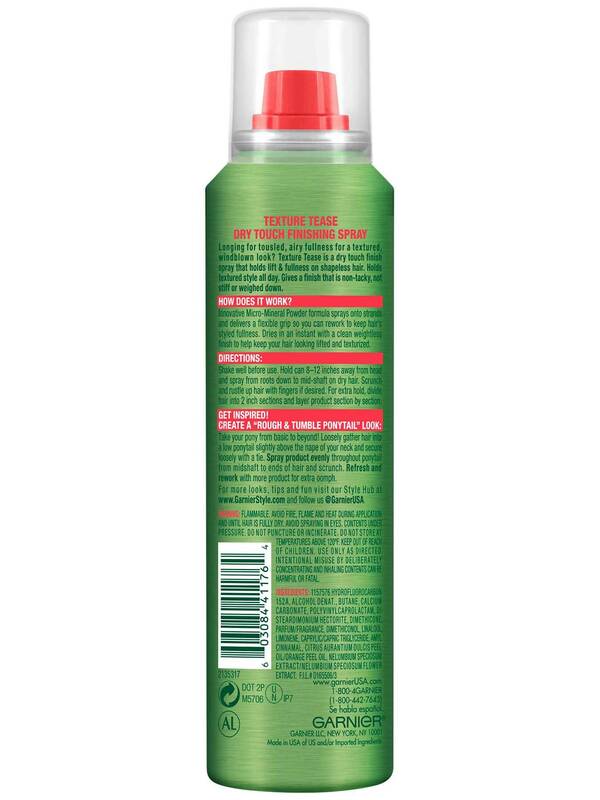 Rated 5 out of 5 by mariaf123 from I love using this spray because it helps keep my hair in place . It is so easy to use and works all day. I use it for work or just to go out. It smells good and doesn’t make my hair hard or white.